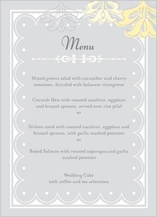 Wedding menu cards are an elegant, high touch addition for a custom wedding invitation. Wouldn't you want to excite your guests with a peek at your delectable food selections, especially when you've put so much thought into them? Use menu cards for either formal sit-down or buffet-style wedding receptions to describe each course and dish, from appetizer through entrÃ©e and dessert. Include menu cards inside your unique wedding invitation to give guests something to look forward to after your ceremony. You may put menu cards at each place setting or just a single menu card at each table at your wedding reception. 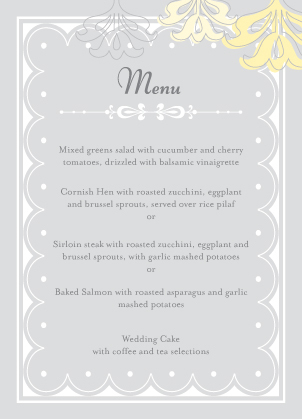 You should also consider including menu cards directly in your wedding invitations. Menu cards provide guests more details for making entree selections ahead of time when needed, and are especially helpful for guests with special dietary restrictions or food allergies. Whether or not you include wedding menu cards as part of your unique wedding invitation, or just place them at reception tables, selecting menu cards is simple with an online wedding invitations expert like LookLoveSend. Choose from hundreds of designs to coordinate with your other wedding stationery components, including reception cards, response cards, wedding programs and direction cards. Personalize your menu cards easily by selecting a design you like, choosing a font style and enter your wording. LookLoveSend knows how important your wedding invitation is to you, including perfect wedding menu cards. We work with you until you are 100 percent satisfied. We have in-house designers, on-site print professionals and state-of-the-art printing technology, so you can be sure your menu cards will be beautiful. LookLoveSend adheres to the highest standards of quality for every piece of your order. We put professional-quality printing, premium quality papers, and expert designers at your fingertips at an affordable price. Take advantage of easy online personalization and exceptional customer service. Your wedding is one of the most important events in your life, and you deserve perfection, down to every last detail!